Today, though, I just wanted to say good-bye to Zimmerman: Ten of Swords. I’ve been reading a bit about that bootleg today and trying to retrace my own Dylan steps. It seems that it was released in 1985. Here’s a review of it from the Philadelphia Inquirer in 1986. It’s a well-curated collection of material from a wide variety of sources: The Witmark Demos, the Minnesota Hotel tapes, the Gaslight, Town Hall, and the “Royal Albert Hall” concert among them. 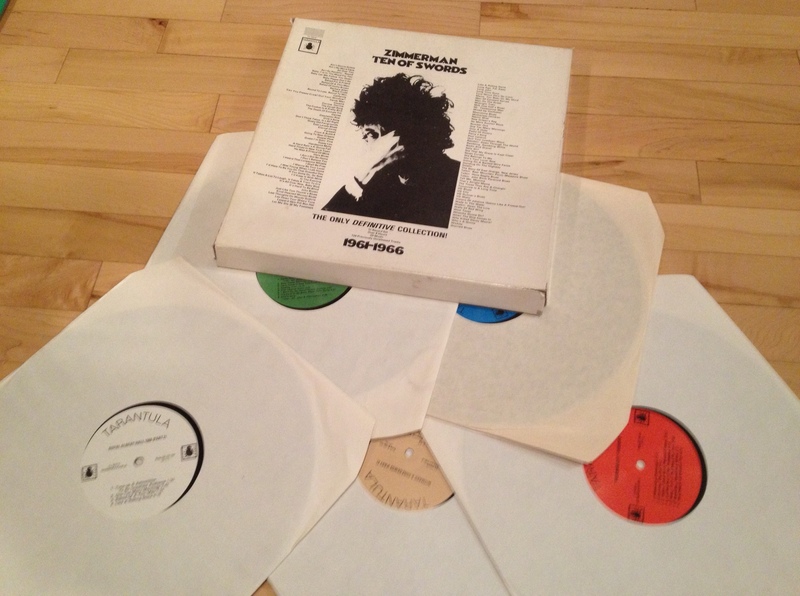 All ten of the discs were pressed on very high quality vinyl, with professionally produced labels. Released by Tarantula Records, whose label cleverly mimics that of Columbia Records. I asked the other day if anyone knew any good histories of album bootlegging, and I got an email referring me to Clinton Heylin’s book Bootleg. I haven’t started reading it yet (probably next week, actually) but it looks interesting. I know that I first discovered bootlegs at a record store in Hamilton, Ontario on King Street. It was a used record store, across from the Silver Snail comics shop. For the life of me I cannot pull the name from the recesses of my memory. They had some vinyl bootlegs on the wall behind the cash and a lot of tapes with handmade covers (on construction paper!) that they sold for $10. That was quite a racket, because I assume he was just recording the bootleg vinyl that he was selling to create a secondary market. I still have those tapes somewhere and am going to try to dig them out. Learning about bootlegs was a big game changer for me. It seemed very illicit, very adult. It wasn’t like buying drugs, but there was certainly a sense that it was against the law. More importantly, it was difficult to know what was going to be good and what was going to be bad in those pre-internet days. I now know that there existed a large network of fans who traded this information through fanzines and printed guides, but at fifteen or sixteen I had no clue at all. The guy would say “that’s a good one” and I’d look at the track list, and I’d take a shot. I guess it was sort of like buying drugs. The ethics of bootlegging were also interesting. Dylan, of course, has long been critical of them – this caused a rift when he toured with the Grateful Dead – and this is one reason that I’ve been reluctant to actually post any here. I’ve been half-assing it by linking to other people posting them. Probably ethically dubious, but I sleep nights. That said, I have a lot of Dylan on my desk at the moment, including every album he ever put out in a nice new box, and if Columbia doesn’t want this stuff bootlegged they can always release it. 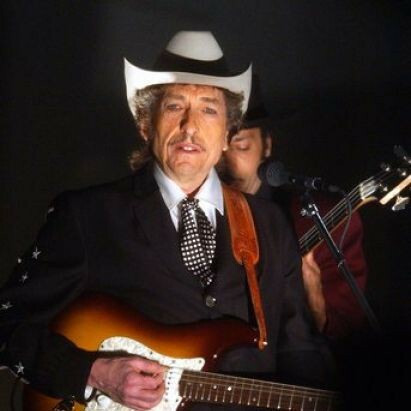 I’m certain that Bootleg Series 4 killed the market for the “Royal Albert Hall” bootlegs absolutely dead. I see now that the bootleg itself has become valuable. Here’s one copy that sold for $549 some time ago. Mine isn’t in as good shape. The discs are probably near mint, but the box got stepped on and so all four corners need to be repaired. I do have the booklet, but it’s not mint any longer. 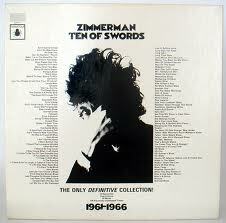 Zimmerman: Ten of Swords was an album that I listened to over and over for years. I think that if I were to sell all my albums, I would probably keep it (well, for $549 you can probably have it). I bought it at a store in Burlington, Ontario – on the east side of Brant, not too far up from Lakeshore, across from City Hall moreorless, also don’t remember the name of that store and I don’t think it lasted all that long. A friend told me that they had it, and I spent my Christmas money on it. December 1985, probably. Maybe 1986. The appeal of “The Only Definitive Collection” was too much for me – I had to have it. It covered the period that I thought was key – 1961 to 1966 – and so I just ignored everything after it. I skipped John Wesley Harding, Nashville Skyline, Self Portrait, New Morning, Pat Garret & Billy the Kid, Dylan, and Planet Waves. Strangely I then owned a run of his next six albums from Blood on the Tracks through At Budokan. Then another gap (Christian period) and then some of the 1980s material. The gap was probably the combination of three things: I knew that this was supposed to be the fallow period, and I didn’t know which were the actually good albums (if any); Biograph covered the most important songs from albums like John Wesley Harding (“Dear Landlord”, “I’ll Be Your Baby Tonight”, “All Along the Watchtower”), and, most importantly, Zimmerman: Ten of Swords taught me that this was the essential, undiluted stuff. It was literally era defining. Released twenty-five years into his career, it told me all I needed to know: the only great years were the first six. Now I’m trying to find out if they lied to be all along, which, I guess, is the whole point of this blog.